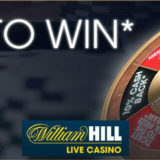 William Hill have launched the Spin2Win promotion this week. The promotion runs from Tuesday 30th August 2016 until Sunday 4th September 2016 from 11:00:00 (GMT until 19:59:59 (GMT). You basically spin a wheel once a day that decides what promotion your eligible for. For prizes that require staking, all your play up to 23:59 on the day will count. 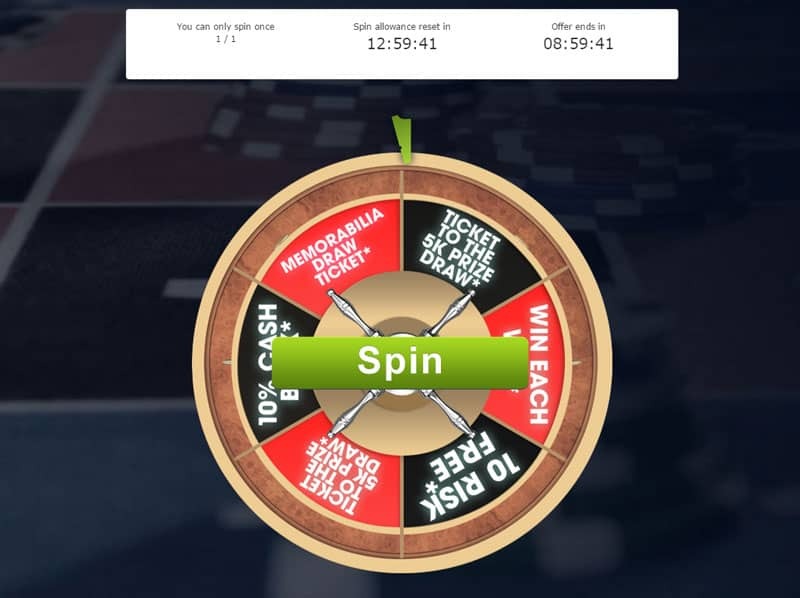 To spin the Wheel click on the Spin2Win Link. 1 x £10 Risk Free on Live Casino Poker. 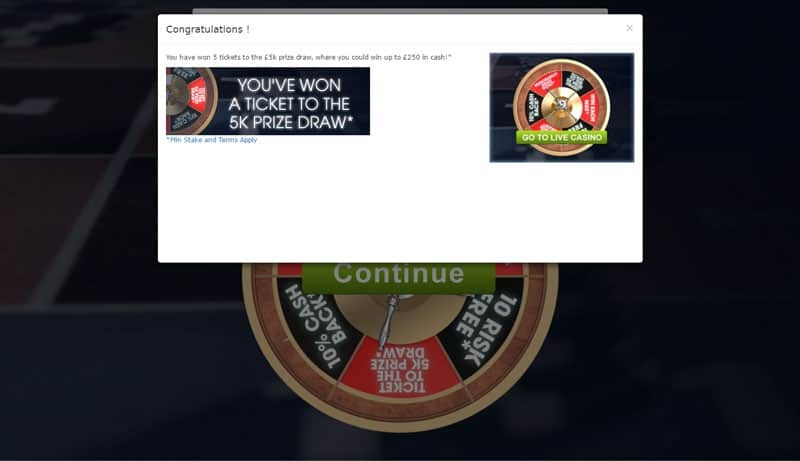 2 x Ticket to the 5k Prize Draw. 1 x Win Each Way. 1 x 10% Cash back. 1 x Memorabilia draw ticket. If you land on this segment you will receive a refund on your losses up to £10 for play on the Live Casino poker tables, Casino Hold’em and 3 Card Poker. To qualify for the £10 you must have staked at least £1 the same day as the prize was revealed. The money is calculated on losses only. Amounts less that £1 wagers do not qualify for the bonus credit. The money will be refunded to your player account by 14:00 the next day. Standard William Hill Terms and Conditions apply, so please read them. If you land on this segment you’ll receive 5 free tickets into the £5,000 prize draw. You can win up to 30 free tickets (5 each day) during the promotion period. The £5,000 prize draw will take place on Monday 5th of September 2016 and 82 players will be drawn at random by computer. 2nd – 5th Position – £150. 6th – 11th Position – £100. 12th – 82nd Position – £50. Under normal play conditions you receive 1 Ticket for every cumulative £10 you wager on any William Hill Live Casino Games. If you land on this segment you get a nifty 10% cumulative Cash Back on all losses up to £100 AND 10% cumulative cashback on all wins up £100. The promotion is available on all Live Casino games but to qualify you have to have placed a minimum stake of £10. The money will be deposited to your player account by 14:00 the next day. If you land on this segment you’ll qualify for 10% cash back on all your losses during the day of winning this prize. Play on all Live Casino games will qualify and you can get up to £100 in cash back. A Free 5 tickets into the Memorabilia Prize Draw will be issued to players who reveal the Prize Draw Ticket offer as their prize. A maximum of 30 free tickets may be won per player over the whole ‘Promotion Period’. The Prize Draw will take place on Monday 5th September 2016 and 4 winners will be drawn at random by computer. Winning players will be notified via Email or Inbox message by 6pm UK Time.